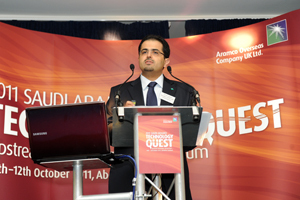 Saudi Aramco decided energy hub Aberdeen was right for its Technology Quest symposium. Pre-event planning: Global oil company Saudi Aramco brought its invitation-only Technology Quest symposium to Aberdeen in October. It was the first time the event was held in Europe, as the previous two Technology Quests took place in Houston. The event aims to unite top scientists and researchers to discuss opportunities to collaborate with Saudi Aramco. To be invited, researchers had to submit an innovative proposal addressing a challenge in one of seven research areas such as reservoir engineering and drilling technology. Aberdeen Convention Bureau arranged a site visit for Aramco representatives, who chose the city after being impressed by the calibre of locally based energy companies and the Hilton Aberdeen Treetops hotel's refurbished facilities. Aramco Overseas Company UK PR representative Laura Baker, who organised the event, says: "We chose Aberdeen as it is a major hub for the oil and gas industry. We chose the Hilton because it met our requirements in terms of the conference rooms needed. We wanted an intimate venue that was easy to navigate." Objectives: The symposium aims to work with individuals and small consultancy firms to tackle the major upstream research challenges faced by Saudi Aramco and the industry as a whole. Saudi Aramco's EXPEC Advanced Research Center manager Samer Al-Ashgar says: "The aim of Technology Quest is to partner and collaborate to find solutions to these challenges." Challenges: With more than 200 delegates expected, Baker says: "Our biggest challenge was finding a venue in Aberdeen that had the right capacities." Solution: "We arranged visits with the help of the Aberdeen Tourism Bureau," says Baker. "They were fantastic. Their extensive knowledge of the area, venues and hospitality options really helped us in making the right decisions." The event used all nine meeting rooms and the ballroom at the 120-room Hilton hotel. More than 200 people attended, with some delegates and employees staying on site at the Hilton, while the rest stayed in nearby hotels. The programme saw delegates attending conference sessions on the first day, where 24 challenges were explained using presentations by Saudi Aramco's technologists. The second and third days were largely taken up with one-to-one sessions, where each delegate had the chance to discuss their proposal with Saudi Aramco's technologists. Baker says: "We had over 160 proposals accepted for review, so there were at least 160 meetings that took place in the space of 16 hours, over two working days. A hectic schedule for some research fields, but extremely worthwhile." Client verdict: The event met its brief "very successfully", says Baker. "We received the highest number of proposals submitted for Technology Quest compared to previous years, and the highest number of delegates." Post-event analysis: Aramco conducted an evaluation both online and offline, and also talked to delegates directly. "The results were fantastic and the conference was very positively received by our delegates," says Baker. October 2011: Post-event analysis takes place.